No one likes the appearance of a double chin. You know that you hate looking in the mirror and seeing it. Now, you don’t have to put up with having a double chin any longer. Plastic Surgery Specialists in Annapolis, MD is one of the first local practices to offer Kybella injections for submental fat reduction, to improve the appearance of a double chin. 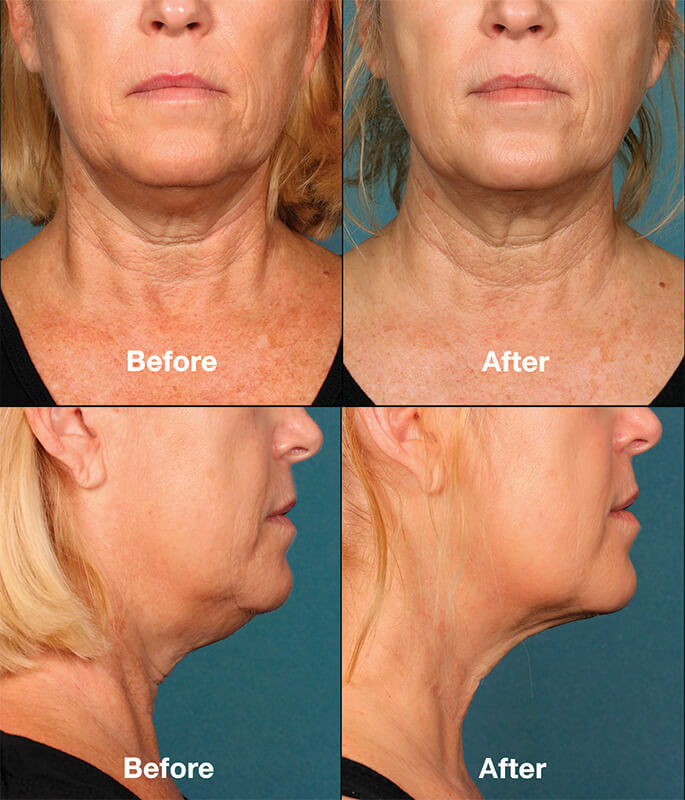 These injections are administered to the double-chin area, and are an innovative solution that eliminates the need for surgery. The development of a double chin is a common issue for both men and women as they age, and can be stubborn in responding to other methods. Kybella is the first and only FDA-approved form of treatment that has been proven to reduce the appearance of fat beneath the chin. Kybella treatment can help patients achieve a more slender, sleeker neck line and contour with a short series of injections. To learn more about Kybella and some of the various cosmetic treatment procedures performed at our offices in Annapolis and the surrounding communities, please call or email us to request a consultation. How Does Kybella Work in Treating the Appearance of a Double Chin? Kybella contains a laboratory-synthesized form of a chemical called deoxycholic acid. This substance is naturally produced by the body in the digestive system to help with breaking down fats in the foods that we eat. When it is injected into an area with a high concentration of fat cells, it works in a similar manner. The walls of fat cells are broken down and the body then flushes away the damaged cells. This leaves the patient with a more defined profile and reduces the appearance of the double chin. Fat under the chin is also called submental fat. It is very stubborn to remove, even for people who are very fit and athletic. Until the development of Kybella, the only treatment solution was liposuction. Kybella offers an effective treatment solution that is non-surgical and non-invasive. Have skin that is somewhat elastic, meaning it will smooth and tighten following the fat reduction. For patients who are dealing with both a double chin and loose skin on the neck, a face and neck lift procedure may be a more appropriate choice. Similar to products such as dermal fillers and other injectable treatment options, a Kybella treatment session is fast and straightforward. The treatment area is gently cleansed and a local anesthetic is provided to minimize patient discomfort. The injection locations are then marked to ensure even distribution of the Kybella. The majority of patients require several injections, which are spaced approximately a centimeter apart across the area to be treated. This process typically takes only 30–40 minutes. Once the procedure is complete, patients are able to return to their regular routine almost immediately. There may be some visible signs at the injection sites—the most common are swelling, bruising and minor redness. To see the best results, most patients require two to four sessions. These sessions are typically scheduled approximately 30 days apart. Depending on the resiliency of the patient’s skin and the stubborn nature of the treatment area, five to six sessions may be required to achieve optimal results. The treatment team at Plastic Surgery Specialists will create a plan for you based on your unique skin conditions and cosmetic goals. Patients can expect to see results in as little as two weeks following the first treatment session. When treatment is complete, patients are overwhelmingly pleased with the smooth and tapered profile that they have been able to achieve. The results from Kybella treatment can last for a long time, and the results can be maximized through maintaining a stable body weight and practicing healthy diet and exercise habits. Tired of looking at that double chin in the mirror or in photos? To learn more about Kybella and some of the various cosmetic treatment procedures performed at our offices in Annapolis and the surrounding communities, please call or email us to request a consultation.